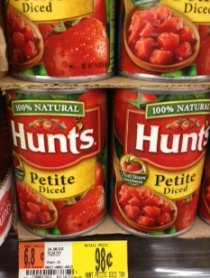 Hunt's Canned Tomatoes Only $0.71 at Walmart! Hurry over and print this rare Hunt's coupon to get a good price on canned tomatoes at Walmart! Final price only $0.71 each! Thank, I Heart the Mart!